The currency and banking crises which the Turkish economy faced in the last sixteen years are generally attributed to financial and fiscal fragilities, typical of developing countries with liberalised capital accounts. Although the sudden stops and reversals in capital flows seem to be the common factor underlying crises of that kind, the three cases analysed in the text took place at different international and domestic conjunctures and were unfolded in different policy environments. In the international context, the volume, composition and degree of volatility of capital flows made a major impact on the severity and evolution of the crises. In the context of the national economy, not only diverse exchange rate arrangements and demand management policies, but also the changing emphases on institutional issues put their imprint on the actual course of events. The paper starts with definitions, explanations and stylised facts about currency and banking crises. It later goes into exploring the behaviour of the relevant indicators (i.e. those related to balance of payments, finance and public sector accounts) in Turkey over the pre-crisis, crisis and post-crisis periods in each of the crises concerned. The possibility of using some of these indicators as advance warning signals is also discussed. The last three crises in the Turkish economy were not simply the outcomes of policy mistakes committed by Turkey alone, but were also highly influenced by systemic features of the world economy working under neoliberal principles. 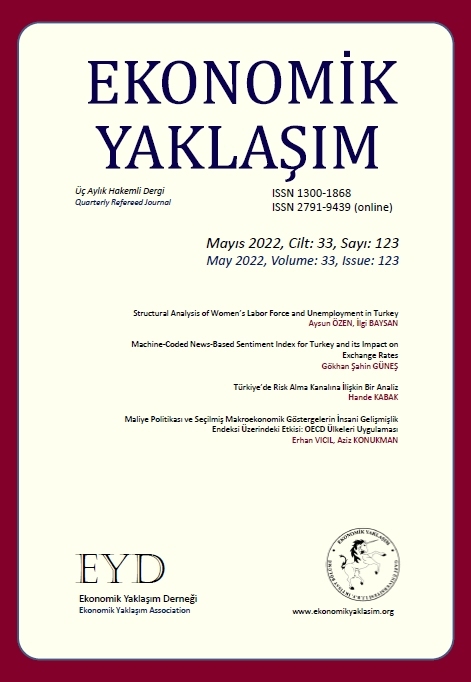 The fact that the Turkish governments since the capital account liberalisation have been either unable or unwilling to monitor the transmission mechanisms of international shocks into the domestic economy suggests that currency and banking crises in Turkey are likely to recur over the medium term. Türkiye ekonomisinin son onaltı yılda karşılaştığı para ve bankacılık krizleri, sermaye hesabını serbestleştirmiş bazı gelişmekte olan ülkeler (GOÜ)deki finansal ve fiskal kırılganlığa atfedilen krizler bağlamında mütalaa edilmektedir. Spekülatif sermaye hareketlerindeki ani yön ve hacim değişiklikleri Türkiyenin üç krizinde ortak ve tetikleyici öğe olarak gözlenmekle birlikte, söz konusu üç kriz, uluslararası ve ulusal ortam ve koşullar açısından farklılıklar göstermektedir. Uluslararası planda, sermaye akımlarının hacim, bileşim ve oynaklığı, yerel krizin evrimini ve şiddetini etkilemektedir. Her üç krizde, kur ve talep idaresi politikalarının uygulanma biçimi ile kurumsal yapılanmaya verilen önem ve öncelikler değişmiştir. Yazıda ilkin GOÜdeki para ve bankacılık krizleri ile ilgili tanım, gözlem ve açıklamalar sunulmakta, daha sonra ödemeler dengesi, finans ve kamu maliyesi alanlarından seçilmiş göstergelerin, kriz öncesinde, kriz süresinde ve kriz sonrasında nasıl davrandığı sergilenmekte, hangi oran ve/veya parametrelerden öncü göstergeler olarak yararlanılabileceği tartışılmaktadır. Türkiyenin yaşadığı son üç kriz, sadece Türkiyenin iktisat politikası hatalarından değil, uluslararası ekonomik düzenin işleyişiyle ilgili, sistemik nedenlerden de kaynaklanmaktadır. Hükümetlerin dış şokları ülkeye taşıyan aktarım mekanizmaları üzerinde etkili olabilecek önlemler almaktan kaçınmaları, bu tür krizlerin orta vadede yinelenebileceğini düşündürmektedir. BaÃ°imsiz Sosyal BÃLÃMCÃLER (2009), TÃ¼rkiye&#8217;de ve DÃ¼nyada Ekonomik BunalÃ½m, 2008-2009, Ãstanbul: Yordam Kitap.---------- (2007), IMF GÃ¶zetiminde On Uzun YÃ½l, 1998-2008: FarklÃ½ HÃ¼kÃ¼metler, Tek Siyaset (2&#8217;nci BaskÃ½), Ãstanbul: Yordam Kitap. Boratav, K. (2010), &#8220;TÃ¼rkiye&#8217;nin Krizi KasÃ½m&#8217;da Son Buldu&#8221;, Sol Haber PortalÃ½, 17 Ocak.---------- (2009), &#8220;DÃ½Ã¾ Kaynak Hareketlerinin Seyri&#8221;, Sol Haber PortalÃ½, 20 EylÃ¼l. Burnside, C., Eichenbaum, M. ve REBELO, S. (2008), &#8220;Currency Crises Models&#8221;, S. N. Durlauf ve L. E. Blume (der. ), The New Palgrave Dictionary of Economics (2nd Edition) iÃ§inde.----------- (2004), &#8220;Government Guarantees and Self -fulfilling Speculative Attacks&#8221;, Journal of Economic Theory, 119(1), 31-63.---------- (2001a), &#8220;Prospective Deficits and the Asian Currency Crises&#8221;, Journal of Political Economy, 109 (6), 1155-97.----------- (2001b), &#8220;Hedging and Financial Fragility in Fixed Exchange Rate Regimes&#8221;, European Economic Review, 45 (7), 1151-93. Chang, R. ve VELASCO, A. (2001), &#8220;A Model of Financial Crises in Emerging Markets&#8221;, Quarterly Journal of Economics, 116 (2), 489-517. Corsetti, G., Pesenti, P. ve ROUBINI, N. (1999), &#8220;Paper Tigers? A Model of the Asian Crisis&#8221;, European Economic Review, 43 (7), 1211-36. DUMÃNIL, G ve LÃVY, D. (2005), &#8220;Costs and Benefits of Neoliberalism: A Class Analysis&#8221;, G. Epstein (der. ), Financialization and the World Economy iÃ§inde.----------(2004), Capital Resurgent, Cambridge, MA: Harward University Press. Eichengreen, B. ve HAUSMANN, R. (1999), &#8220;Exchange Rates and Financial Fragility&#8221;, NBER Working Paper No. 7418. Epstein, G. (der.) (2005), Financialization and the World Economy, Cheltenham: Edward Elgar. Flood, R. P. ve GARBER, P. M. (1984), &#8220;Collapsing Exchange Rate Regimes: Some Linear Examples&#8221;, Journal of International Economics, 17(1-2), 1-13. Independent Social Scientists Alliance Of TURKEY (ISSAT) (2006), Turkey and the IMF: Macroeconomic Policy, Patterus of Growth and Persistent Fragilities, Penang: Third World Network. Kaminsky, G.L. ve REINHART, C. M. (1999), &#8220;The Twin Crises: The Causes of Banking and Balance of Payments Problems&#8221;, American Economic Review, 89(3), 473-500. Obstfeld, M. (1996), &#8220;Models of Currency Crises with Self-fulfilling Features&#8221;, Europan Economic Review, 40(1), 1037-47.----------- (1994), &#8220;The Logic of Currency Crises&#8221;, Cahiers Economiques et MonÃ©taires, 43, 189-213. Ãzatay, F. (2009), Finansal Krizler ve TÃ¼rkiye, Ãstanbul: DoÃ°an Kitap. Ãzkan, F.G. ve SUTHERLAND, A. (1994), &#8220;A Model of the ERM Crises&#8221;, CEPR Discussion Paper, No.879. TÃ¼rel, O. (2009), &#8220;DÃ¼nya Ekonomik BunalÃ½mÃ½nÃ½n TÃ¼rkiye&#8217;ye 2008-2009&#8217;daki YansÃ½malarÃ½ Ãzerine Notlar&#8221;, Finans, Politik ve Ekonomik Yorumlar, 46 (533), 9-34.YELDAN, E. (2010) &#8220;Ekonomide Ãkilemler ÃoÃ°alÃ½yor&#8221;, Cumhuriyet, 10 Mart.---------- (2001), KÃ¼reselleÃ¾me SÃ¼recinde TÃ¼rkiye Ekonomisi : BÃ¶lÃ¼Ã¾Ã¼m, Birikim ve BÃ¼yÃ¼me, Ãstanbul: ÃletiÃ¾im YayÃ½nlarÃ½. YÃ¼kseler, Z. (2009), &#8220;TÃ¼rkiye&#8217;de Kriz DÃ¶nemlerinde Ekonomik GeliÃ¾meler ve Ãdemeler Dengesi Uyumu&#8221;, Ankara: TCMB (Haziran), eriÃ¾im: zafer.yukseler@tcmb.gov.tr. Development Studies Research 2019; 6(1): 13.